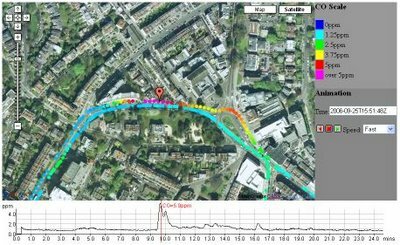 Richard Milton, a researcher at CASA working on our GeoVUE project (funded by NCESS), has produced an interesting use of Google Maps to visualise urban pollution trails. As a result of the write up of his work, in New Scientist, the BBC got in touch to film a sequence based on measuring carbon monoxide levels from a cyclists perspective. The Google Map features a colour coded time line of pollution, animating along the path linked to a java applet. The peak of carbon monoxide emissions is as the presenter got stuck behind a bus..
Richard has written up his account of the experiment on the CASA Blog.